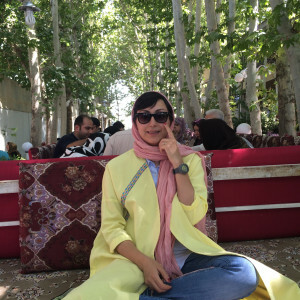 Over the next two weeks, Adele Ghalibaf, an Iranian instagrammer, will take over our Instagram account. Adele: I was born in 1984 in Mashhad. I am the youngest child in a lovely large household. Growing up in an enlightened family with lots of books and newspapers around me, I got interested in art and culture. I studied Chemistry in college, but it never satisfied my ego. So right after my graduation, I decided to follow my personal interests. My main interest was ethnic and folk costumes. After several trips observing and learning traditional stitching in different regions I started to design modern clothing based on traditional stitching techniques with local handmade fabrics. At first, it was just a personal interest, but with the urge of my family and friends, I showed my designed costumes in two exhibitions. CK: what drives your work as an Instagramer? Adele: When I joined Instagram it was just because of my curiosity. Since I really don’t like to talk and communicate with people (with words!) as soon as I learned interaction with people through photos is much easier and interesting, photography attracted me and I stayed in Instagram! Adele: In a typical week, I do ordinary tasks like reading, writing, take care of my plants and etc. Also, I love to travel and shopping. Adele: I love all foods except ” Kalam polo”! (cabbage and rice). We usually have our lunch at my mom’s house. The most loved are: Khoresht Gheimeh (Meat Stew), Loobia polo (Beans and rice), Khoresht Karafs (celery stew).